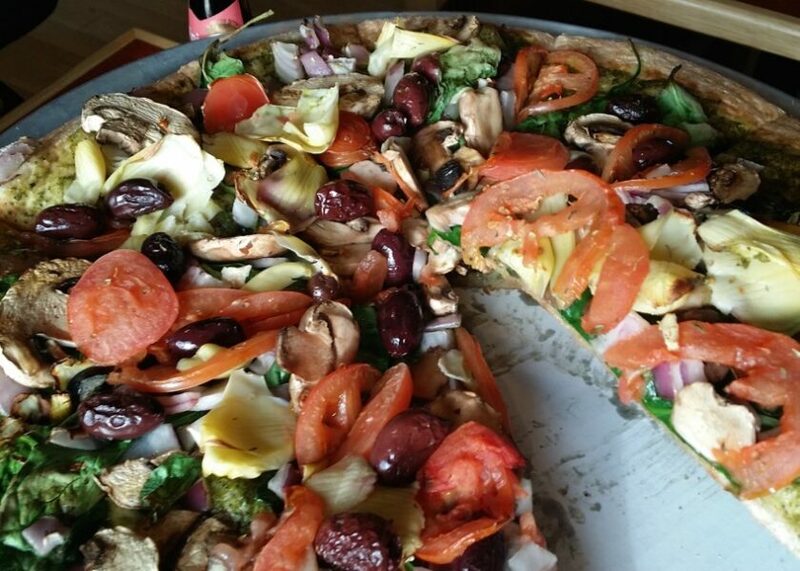 Ordering vegan pizza at a non-vegan pizza joint is possible- just ask! After completing the Hard Hat Tour at New Glarus Brewery, we decided to grab a bite to eat before heading to Madison for the night. Since going vegan, or as we prefer to say, whole-foods, plant-based, we’ve become more comfortable with making requests to have our meals modified when we’re eating out. With a few modifications, it’s possible to eat a vegan pizza at a non-vegan pizza joint. Just ask for the changes that your diet requires! Dusty and I prefer to do some research before we take a road trip when it comes to restaurants and attractions. This way we can have the best experience possible when traveling to a new city, ensuring we won’t miss a great place to eat. Sure it’s fun to be spontaneous, but there’s no need to pick a restaurant that has generally bad reviews if you do a little research ahead of time! Using Trip Advisor, we found a place that would allow us to make some meat & dairy-free choices, which can be a bit of a challenge in Wisconsin- America’s Dairyland! Typically, we will either select the town we want to visit on Trip Advisor, or in this case we Googled best places to eat in New Glarus. According to reviews, there are several popular places to eat. We chose Sugar River Pizza, which happens to be ranked #2 for places to eat in New Glarus. Although it didn’t have vegan menu options, we knew could make special requests to fit our dietary needs. If you’re wondering why we were looking for meat-free dinner options, you can read about that here, here and here. We arrived at Sugar River Pizza around 4:30 on a Friday afternoon and it was already getting full. This is a sure sign that it’s a great place to eat! They have a nice menu and we found a couple of meat/dairy-free options. We were going to have a hummus appetizer but they were out of that (what?!) so we settled on a liquid appetizer of Spotted Cow and went ahead and ordered our pizza. We chose the Mediterranean Pizza: basil pesto base with Kalamata olives, baby spinach, artichoke hearts, tomatoes and feta. We left off the feta and it was totally meat & dairy free! With a few modifications, it’s possible to eat a vegan pizza at a non-vegan pizza joint. Just ask for the changes that your diet requires! One “funny” thing was what our waitress said to us when we ordered our pizza without any cheese. She gave us a strange look and said “it’s like you can’t even eat food”. Never mind that we requested that Feta be omitted. LOL. This likely was a very strange request at a restaurant in Wisconsin (Dairyland). We’re going to add that to our list of funny ways people respond to you when you mention the word Vegan, which is why we prefer to say whole-foods, plant-based. Often times that confuses people and sometimes you just know that you’re going to be more direct in order to get what we want, so we’ll use the word vegan instead. The moral of this story is don’t be afraid to make special requests when you’re eating at a restaurant. Being meat-free and dairy-free is a choice that we like but chose a restaurant that didn’t offer actual vegan options. Sometimes you are stuck like this but it’s good to be flexible. We simply requested modifications to a meal that would fit our dietary needs. Was the pesto dairy free? I often find that places make is with Parmesan making it a no go for me ???? Amy- you’re totally right! I think it’s safe to say there wasn’t a chance the pesto was vegan. We did the best we could given our choices!